Recorded and Remixed at The Record Plant, Los Angeles, Calif. Mastered at ABC Recording Studios, Los Angeles, Calif.
Management and Direction: Robert Ellis & Associates, Hollywood, Calif.
and at least as good. "Please Pardon Me..." really shows that they're able to make masterpieces. "Stop On by" was a singel. 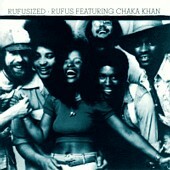 - Rufus, "I'm A Woman (I'm A Backbone)"
Go to the Funky Discography or to the Main Page.